Check our our current local co-op orders here. Or visit our store to order our products anytime. Sprouted flour has entered the marketplace as people from all walks of life search for products that provide a convenient and nourishing alternative to foods that have caused or exacerbated the health issues they face today. Sprouting wheat significantly decreases gluten in the grain, neutralizes phytic acid, an antinutrient that blocks minerals from being absorbed by the body, and also radically increases folate, vitamin C, B6 and niacin, providing a much more digestible and nutrient dense food. Although making a traditional food like sprouted flour requires a few additional steps, it’s really pretty simple to do, and the end result is a convenience food that doesn’t need further soaking or fermenting. 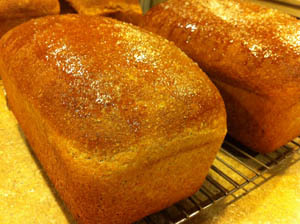 I’d like to walk you through the steps and show you the beautiful loaves of bread I made with sprouted flour. It tastes almost the same as regular homemade bread, although it’s softer, and I’ve found that bread made from sprouted flour actually keeps a little bit longer than regular homemade bread. You can choose to sprout many different types of grain and then mill the dried grain into flour: rice, buckwheat, millet, spelt; really any non-oily grain will work. I’m going to focus on making sprouted wheat flour here, but the process is pretty much the same for other grains as well, so feel free to experiment. 2. Pour the wheat into a large glass bowl or ceramic crock (If you have a container like this with a lid, that would be ideal. ), leaving space for the wheat to swell up to twice its original size. 3. 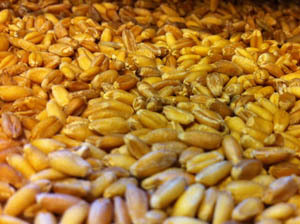 Fill the container of wheat with water to at least two inches above the level of the grain. Cover the bowl and leave it out overnight. 4. In the morning, drain the wheat through a strainer or a colander lined with a clean white cloth, and rinse it, taking care to stir the wheat so it all gets rinsed. TIP: At this point, the wheat has begun to germinate. It’s best if you can continue until you can see the tiny beginnings of the sprouts. But if you need to, you can skip right to step 6. Your bread will turn out better if you stop the sprouting process a little early rather than allow the sprouts to develop too much. 5. 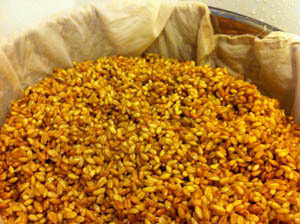 Throughout the day, rinse the wheat a few more times, and watch for the little sprouts to emerge. Depending on the temperature and humidity, you may have already seen some sprouts right away in the morning, or it may take several more hours. What we want to do is lock the grain in the ideal stage where there is just a tiny little sprout. Once you see it, move on to step six. This is what you’re looking for. 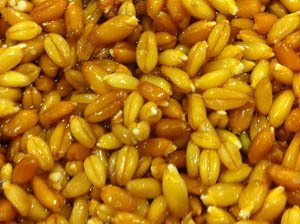 See the little white spots on the ends of the wheat berries? Those are the new sprouts. 6. 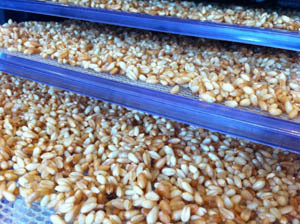 Now spread your sprouted wheat thinly onto dehydrator sheets and dehydrate at 115 degrees for about 12 hours. Alternatively, pour it onto cookie sheets and dehydrate in the oven at as low a temperature as you can achieve. Before I owned a dehydrator, I used to spread my sprouted grains on towels all over a spare counter, and that worked well in the winter when the weather was dry and the heater was running. 7. Once the grain is completely dry, just mill it in your grain mill as you normally would and use it exactly as you would use regular whole grain flour. TIP: Before you mill the wheat, squeeze one grain between two sheets of paper towel with a pliers to make sure it’s completely dry. If there’s a wet spot on the paper towel, dry the wheat more before you continue. This is actually my regular bread recipe; no need to reinvent what’s working well, right? 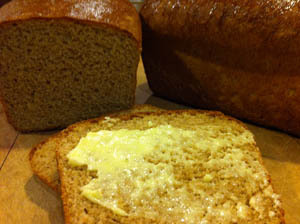 The only difference is that this bread was made with 100% sprouted flour. 2 cups fresh whole milk Note: Since it’s been so humid, I’ve found it necessary to cut back on this amount of milk by at least 1/4 cup. Keeping back some of the liquid is better than adding more flour. Just don’t pour in all the milk, or decrease the amount of water you use to dissolve the yeast. 1. Heat the milk with the honey just enough to scald it. Then let it cool while you prepare the dry ingredients. 2. Dissolve the yeast in the warm water and set it aside. 3. Put all 6 cups of the flour into a large bowl (or Bosch mixer) along with the salt. Mix these ingredients together. 4. When the milk mixture is cool (about 98 degrees) add it to the flour mixture along with the yeast mixture. Mix the whole thing together, adding any necessary water to make a soft dough. Then knead it for about 6-8 minutes in the Bosch mixer, or 15 minutes by hand. 5. Just before you’re finished kneading the dough, add the 2 tablespoons of butter in bits, and knead it in. 6. Put the dough in a large buttered bowl, cover it with plastic wrap and let it rise in a warm place until it has doubled in size. 7. Punch down the dough. Cut it in half and work it into a ball by tucking the edges into the middle until it is smooth on the top. Then press the bottom of the dough against the counter as you slide it towards you to seal the bottom. Repeat with the other half of the dough. 8. Place the dough in two greased bread pans and let rise, covered, for about 45 minutes, or until doubled. 9. Bake at 350 degrees in a preheated oven for about 25 to 30 minutes or until golden brown. 8. Turn the loaves out of the pans immediately so they don’t sweat. Then put them on wire racks to cool.